When I lived in Boston, I had the chance to run the Boston Marathon. It was an exciting race and I don't think I'll ever forget that experience (especially the Wellesley mile at the half-way point). Phil Packer is a disabled veteran who is taking days to complete the London Marathon. His story is on CNN. 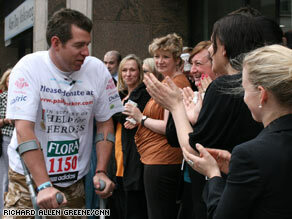 His goal is to raise £1 million ($1.5 million) for Help for Heroes, a British non-profit supporting wounded veterans. I admire his passion and his perseverance. Next month, Packer will be in California climbing El Capitan in Yosemite.